I can’t believe that someone would foolish enough to carry phishing attack against Singapore Government. Isn’t this violates Singapore’s Law? According to Prof. Warren Chik, it does violate the law. Spread misinformation. I’m not sure how someone can directly profit from this. Stole SingPass credentials. There are areas in MOM’s website that requires you to login using SingPass. SingPass is used to access all public services provided by Government. Any financial transactions on these services will go through payment gateway like E-NETS/Bank. So I don’t think anyone can directly profit from stolen SingPass. It’s a test website. It’s possible, but very unlikely. Who would careless enough to develop website in open internet? If you look at MOM’s website HTML source, you can tell that it’s using SharePoint. If the copycat websites also using SharePoint, then very likely they really are test website. The interesting point is that these websites uses .sg domain. 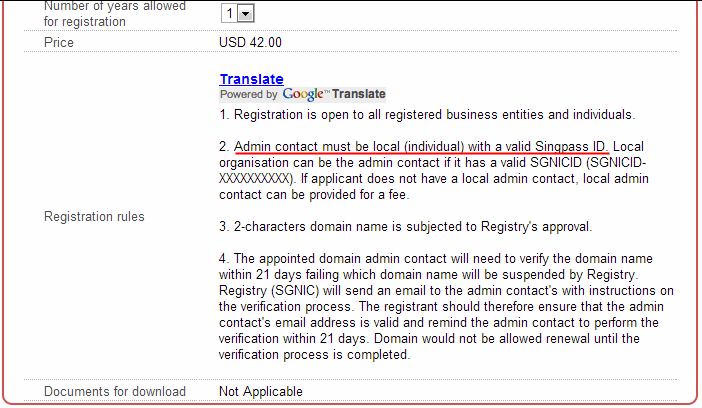 Dot-SG domain is an exclusive domain managed by SGNIC. According to their rules, anyone (locals or foreigners) can register .sg domain as long as they have local Singapore postal address. 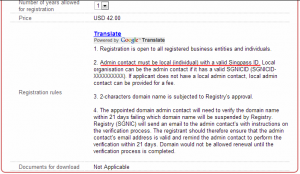 On one of SGNIC’s accredited registrar (IP-Mirror), I found a more detailed restriction which states that the domain contact person must have a valid SingPass ID. Hmm.. do you think this is the motive? Harvest as many SingPass ID you can get, use them to register .sg domains which later be used for fraud/scam. Registrar:   INSTRA CORPORATION PTY. LTD.
click on a ‘Verify Identity’ button. With this, I am sure it will be very easy for SPF (Singapore Police Force) to find out the individual who registered these two domains. After all, these two domains were verified using SingPass ID. Unless, it was already a stolen SingPass used to register. Whoever own the compromised SingPass ID will have the burden to proof that they were not the one validating these two domains. Since When MyBlogLog supports more than 300 contacts?